The heat for the past two weeks have been excruciatingly unbearable, and it most certainly doesn’t help to know that the haze is back!!! I’m down with a sore throat and some of my students are suffering from hacking coughs. Not helpful at all neighbour. Please ask your farmers to stop the burning! Mid-summer blues under the scorching weather makes one all sluggish and lethargic, not wanting to do anything except to stone in an air-con room. To make myself feel better, I’m thinking of some sugary and cooling “tong shuei” to help beat the heat. Well, I could cook a sweet 六味汤 luk mei tong or double boil some 南北杏木瓜炖雪耳 White Jelly Fungus with Papaya, or simply reprise my favorite 楊枝甘露 Mango Pomelo Sago desserts, but I’m thinking of something even simpler for instant relief. Happen to chance upon some melons at our local supermarkets just last weekend and lugged home some since they are so affordable now that they are in season. A good time to revisit one of my childhood favorites which I hadn’t eaten in eons, 蜜瓜西米露 Honeydew Melon Sago. 蜜瓜西米露 Honeydew Melon Sago is a dessert which I’d eaten when I was still a boy. The combination of flavours is very simple but the sweetness drawn from good melons are most memorable, accentuated by the slightly savory coconut milk. I’m not quite sure the Cantonese do this as well, but salt and santan is a combination that can never go wrong. At least that is what my kueh making learning process has taught me. The summer fruits are making their appearance now in all pomp and circumstance, and melons are no exception. In fact in Singapore, we see an increase in the varieties available in our supermarkets more so than before. There are the usual Malaysian honeydews of course, characterised by their yellow and somewhat smoother skins with minimum netting, but the quality seems rather inconsistent, sometimes sweet to break the Brix scale but otherwise, tasteless beyond belief. I stopped buying those for quite a while already. On the other end of the scale are the Japanese musk melons, costing easily 20-30 times more than the Malaysian honeydews, but of course very gratifying in taste and aroma but not so on the wallets. Then there are the Chinese hami melons which are cheap, sweet and with a good crunch which I’d used here, together with the Korean musk melon, some strain as the ones from Japan at a fraction of the price. 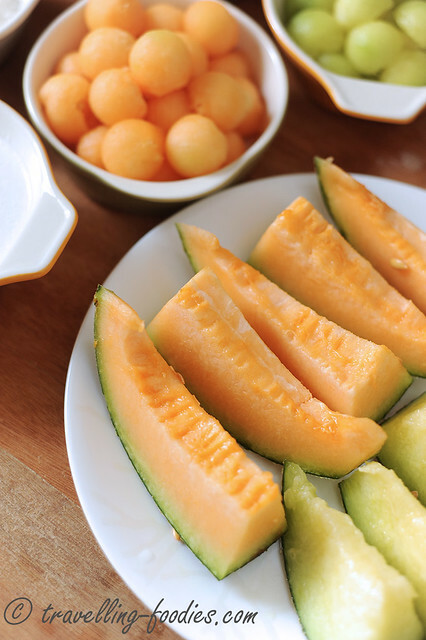 My favorites are still cantaloupes but I couldn’t find a good one this season. Those imported from Honduras were crap. I would have used the spanish frog melons if they were available again now but alas fate is not meant to be. The ingredient list is really simple with only a small handful of ingredients. Everything has to be properly chilled to provide maximum satisfaction. Remember to give it time to chill please and not try to hasten the process by adding ice cubes to dilute the coconut milk. The oomph factor would also be discounted, that I can assure you. Heat water in a saucepot and add sugar. Stir thoroughly until sugar melts, without bringing mixture to a boil. Take the saucepot off the heat and pour the syrup into a large bowl. Pour in coconut milk, salt and stir well. Chill the coconut milk syrup mixture in the fridge when it has cooled down to room temperature. In the same saucepot, add water and sago pearls. Make sure that the water level is at least 5 cm above the pearls, to allow enough water volume for the sago to move around during boiling. Cover with lid and bring to a boil, after which the flame is lowered slightly, but ensure that the sago pearls are still about to move around within the boiling water with ease. Cook the sago pearls until there is still a bit of opaque white left in the centre of the pearls. Turn off the heat now and use the residual heat to continue cooking the pearls until they are just transparent. Strain the cooked sago pearls to remove the excess cooking water and set aside in a small bowl and cool to room temperature. 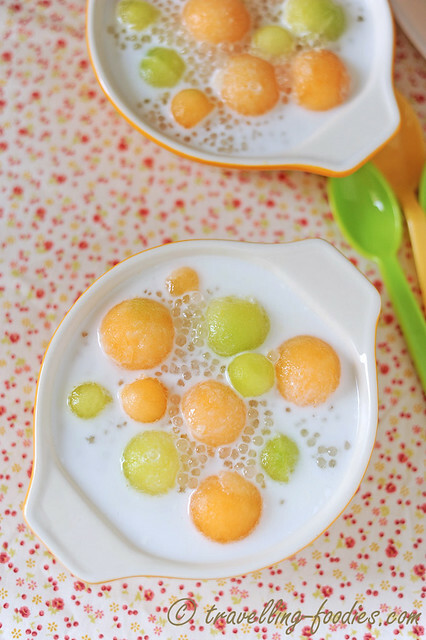 Take out the coconut milk syrup mixture from the fridge and pour in the sago pearls. Stir well to break up any lumps. return the mixture to the fridge to chill somemore. 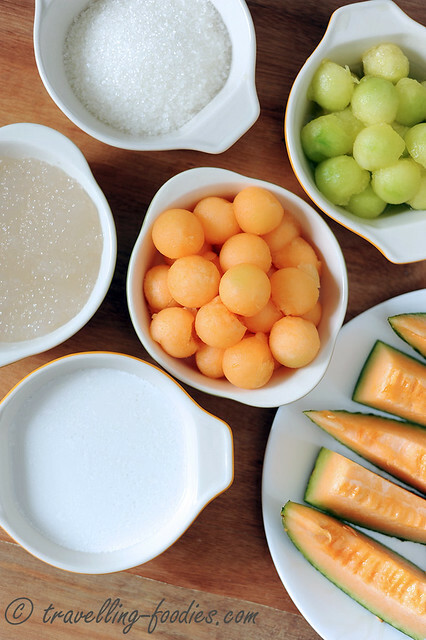 To serve, scoop a generous dollop of chilled melon pulp at the bottom of the serving bowl, and arrange some pieces of melon balls or pieces over the pulp. 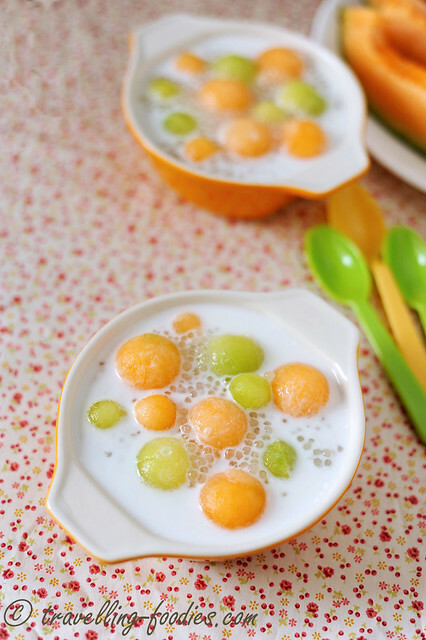 Ladle a generous amount of the coconut milk syrup with sago pearls over the chilled fruits. Serve chilled, remembering to mix the pulp at the bottom well with the coconut milk syrup before enjoying. This entry was posted on August 21, 2015 by Alan (travellingfoodies). 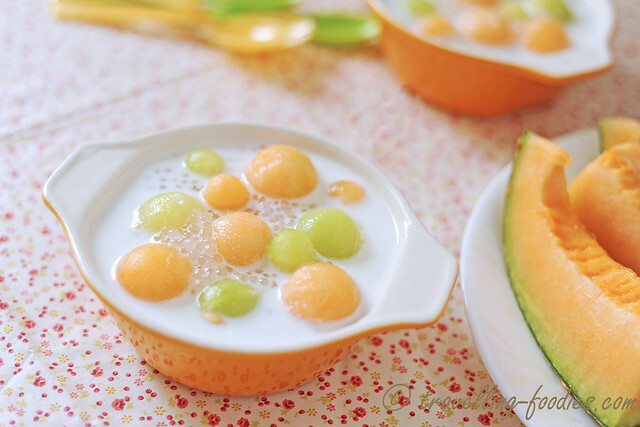 It was filed under Food, Simple Eats and was tagged with coconut milk, 甜点, dessert, 蜜瓜西米露, 香瓜, Honeydew Sago, melon sago, musk melon, sago pearls, 哈密瓜.